Try a new take on chicken with our Garlic Chicken Thighs recipe. 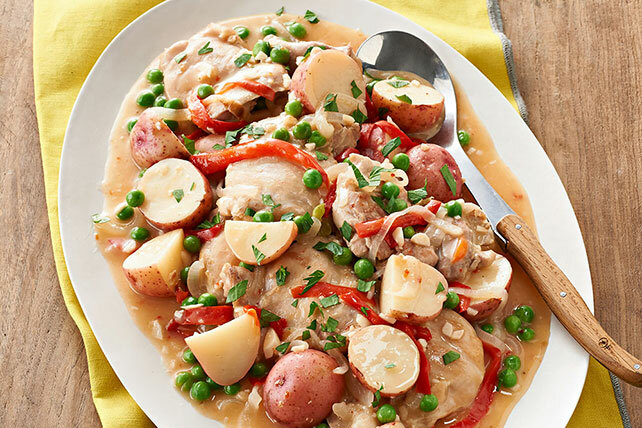 This delicious Garlic Chicken Thighs recipe is a great reason to get out your slow cooker. Place potatoes, onions, peppers and garlic in slow cooker sprayed with cooking spray; top with chicken. Whisk flour, dressing and lemon juice until blended; pour over ingredients in slow cooker. Cover with lid. Stir in peas; cook, covered, 10 min. or until peas are heated through. Sprinkle with parsley. Prepare using KRAFT Zesty Lime Vinaigrette Dressing, and substituting lime juice for the lemon juice and fresh cilantro for the parsley. Discover how easy it is to cook one of your favorite Italian classics in your slow cooker! And as a bonus, the colorful red peppers and peas in this flavorful low-sodium dish provide vitamin C.